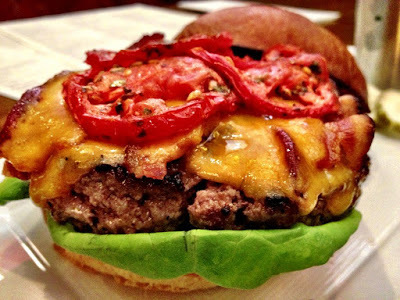 Residents of the Woodlands have no shortage of good burger places in the area. From national franchises to local chains to mom-n-pop stores to chef-driven restaurants, folks in the Woodlands can eat burgers every day for a month and not visit the same joint twice. And yet the new burger concepts keep coming. As your intrepid servants, we feel that it is our duty to check out the most interesting burger concepts and pass on to you the ones that are worth a visit. 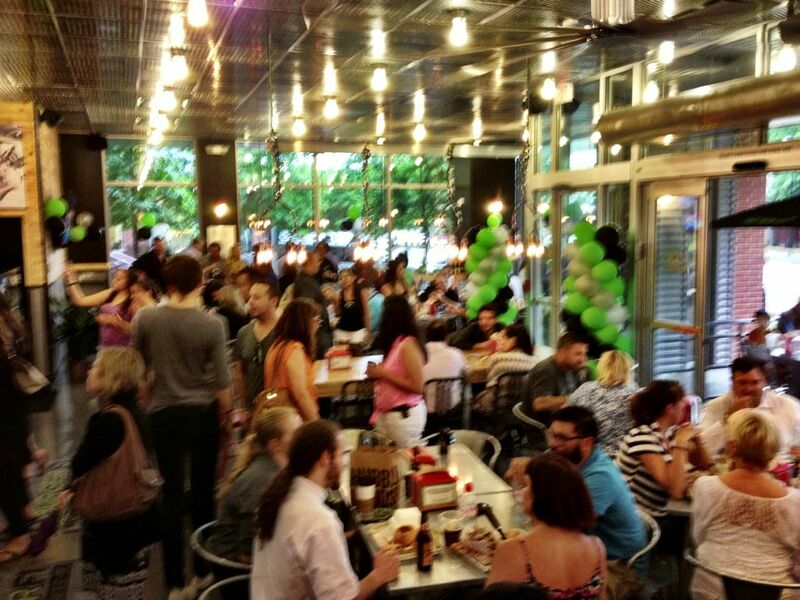 The Woodlands Waterway neighborhood is now home to the Houston area’s first BurgerFi location. 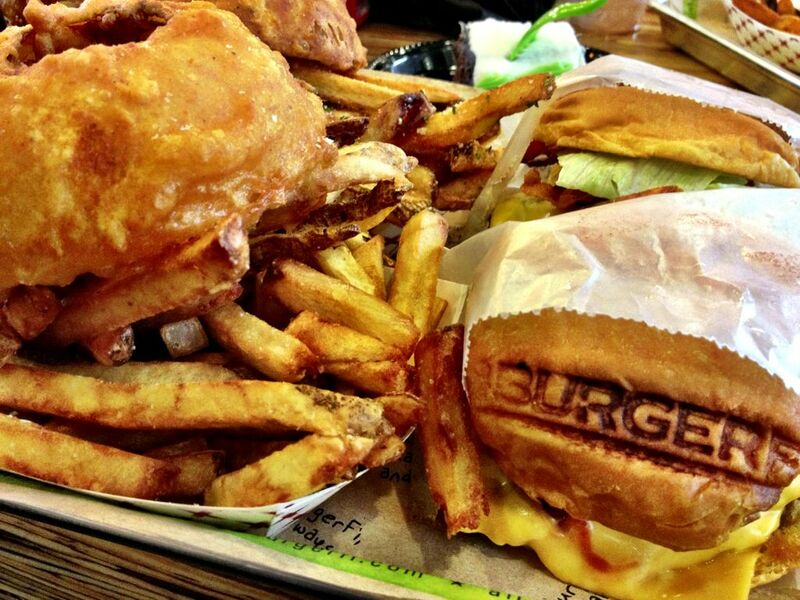 BurgerFi is a Florida-based burger chain that picks up where other “better burger” concepts leave off. A primary focus is on healthier, all-natural ingredients, including grass-fed, never frozen burger patties. 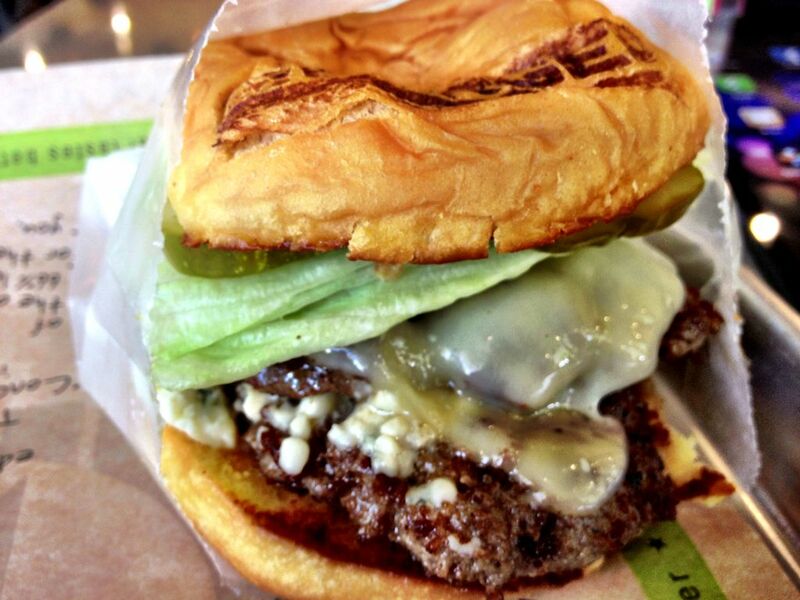 Uniquely, BurgerFi offers different types of patties to choose from, including grass-fed Natural Angus, 28-day dry-aged ground brisket, and crisp quinoa-based veggie. They even offer an all-day breakfast burger, with ingredients such as bacon drizzled with maple syrup and hash browns. Clearly, this isn’t your average burger joint. But how do these interesting creations taste? We find out. As purists, we wanted to sample a basic burger in all its nearly-naked glory. Some burger chains hide a mediocre burger patty behind a lot of “gourmet” toppings, and we think this is like putting lipstick on a pig. (We’re looking at you, The Counter.) 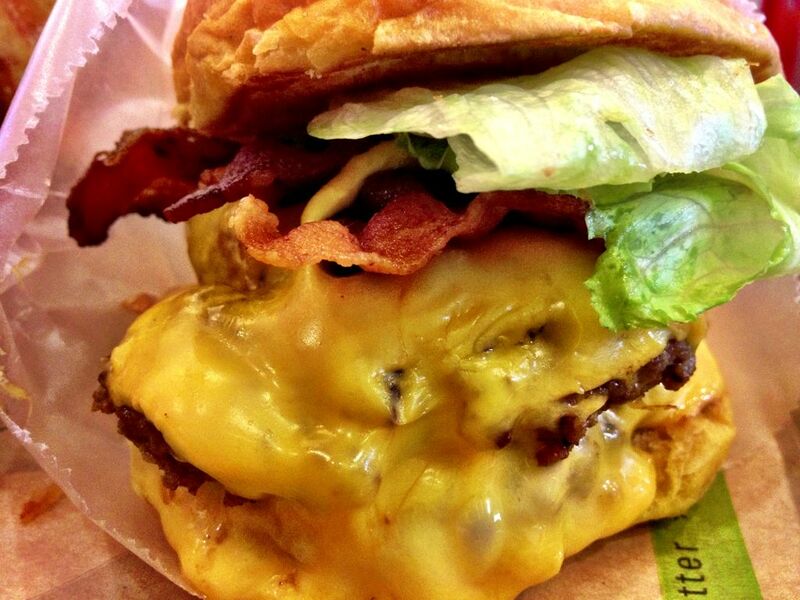 So we started with a basic double bacon cheeseburger, selecting American cheese from the available varieties. Biting into the freshly branded (with the BurgerFi brand logo) bun revealed a lush beefy flavor, accented by the mild American cheese. The beef was cooked medium well, but hadn’t lost its juiciness; a credit to BurgerFi’s process. The bacon added a nice smoky and slightly peppery undertone, and the veggies brought welcome crispness and a zing of acidity to the mix. All in all a nicely balanced burger, which we devoured in record time. How does it compare to other “better burgers”? I enjoyed it more than Five Guys, but less than Smashburger or Beck’s Prime. My biggest complaint was the size. 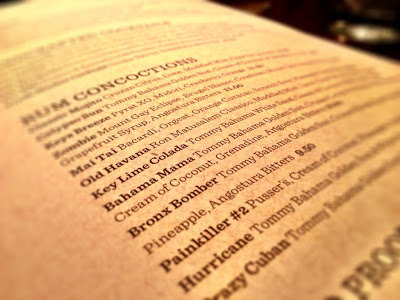 Rarely do I feel hungry after eating an upscale burger, but about one and a half of these would have been perfect. For light eaters this may be a positive. We also sampled several of the most popular sides: Fresh-cut fries, Parmesan and herb fries, and the ginormous onion rings. Yes, that is a single onion ring on the left. Clearly, the highlight was the onion ring. Huge, freshly cut union slabs were divided into rings, generously breaded with a barely-sweet batter, then deep-fried to golden brown crispness. The flavor was superb; the only downside was that the rings were so large that a knife and fork were required to eat them. The fries were tasty but unremarkable. We preferred the extra flavor provided by the parmesan and herb dusting. We can’t help but wonder if the trouble and expense of cutting fresh potatoes is worth it. We also sampled the interesting brisket burger. Topped with both swiss and bleu cheese, two quarter-pound patties of dry-aged ground brisket brought a very different flavor profile to the table. The rich, beefy flavor of the regular Angus patty was replaced by a deeper, more earthy and robust flavor, reminiscent of a barely smoked beef brisket. The swiss and bleu cheeses added a lush, tangy tone. It was a tasty sandwich, but the patty just didn’t say “burger” to us. We don’t think this burger is for everyone, but some folks are going to love the different approach to creating a cheeseburger. Finally, our favorite. The veggie burger. OK, we’re kidding. We didn’t try the veggie burger. You should know better. Downsides? The burgers aren’t huge, and the meals are a bit more expensive than we’d prefer, attributable to the slightly pricey fries and drinks. All in all, we enjoyed the offerings at BurgerFi, and feel that they are a nice new option for burger lovers in the Woodlands. These burgers sound and look better than the ones at Elevation. Can't wait to try them when I get back to the Woodlands office. 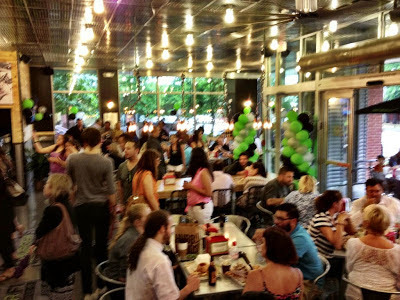 And New York Magazine certainly likes BurgerFi – they named it one of that city's best in their recent "Cheap Eats" issue. Sounds like it's worth a try. The priciness may be a deterrent, but the key to any good eating establishment is good food, good service and quality restaurant supply Houston equipment. Music way toooo loud for a lunch crowd!